Q: What is lineage teaching? 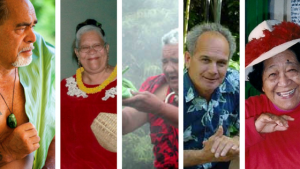 What is the source of Ho’omana’s Lomi Lomi teaching? Is lineage important? Just as a kumu hula has a hula genealogy, I think it’s very, very important to know your Lomi Lomi genealogy. I had many kumu. We have an ‘olelo no’eau, a Hawaiian proverb, that says that all learning does not come from one school. ‘A’ohe pau ka ‘ike i ka halau ho’okahi. One can learn from many sources. For all of our Ho’omana kumu, they had many kumu as well. Aunty Mahi had many kumu throughout the islands, Aunty Margaret also had different kumu, and Kuma Maka’ala also had six kumu. For our particular lineage at Ho’omana, my journey began with the Auntie Margaret Machado. Then Sylvester Kepelino, Aunty Mary Fragas, Aunty Mahilani Poepoe, Kahu Lyons Naone, Kumu Maka’ala Yates, and Kumu Mike Kumukauoha Lee, as well Rebecca Slavin (haumana, student, of Abraham Kawai’i). Recently, Brother Chuckie Miller were comparing notes. “You got eight years with Aunty and I got less than two years,” I said. I really believe that to be true. Have you had a situation happen and think…did I just make that up? One day, as I was looking at the body, I began to see a vapor. Like you might see in a mirage in the desert or if you were looking at a hot asphalt on a hot day. You can see a steam or vapor rising up from the hot surface under the heat of the sun. Just a little movement…you know? Anyway, I was working on the body and I noticed that, right where they were having their discomfort, I saw a vapor rising off the body. The first couple times I saw it, I really didn’t make note of it, but then I started correlating that the further that it was rising off of the body, the more inflammation and discomfort that person was having in that area. It wasn’t the same from one side to the other. Then, I also noticed when I was working on someone, I began to feel as though I had to take a very deep cleansing breath. Somehow, I knew the energy was moving through them. As I began to work with this more and more, I began to realize I could also feel it. If I put my hand to the point where I saw this vapor rising off of the body, I could literally feel the heat. Time for a test. When I pulled my hand away from the point where I saw the vapor rising, I couldn’t feel it anymore. If I put my hand back to the point, then I could feel the border of where that energy was. Everybody has their different gift. Some can see and some can hear it in their body and then they know where to go. I’ve heard some people who can only describe a “sense of knowing” exactly where the problem is. They don’t really know where the knowing came from. When I began to see energy and that I could feel the energy that I was seeing, it got me so excited to be able to share this with others. I began teaching students in class about that vapor rising off the body. To look for insight into the energetic climate of what was going on with the client. I taught them to measure the energetics before and after a session. I began to notice that we can affect the client even before we begin working on the body. Just measuring and acknowledging the energetics begins the process. As healers, immediately we get to work, especially if we have had any experience with energy work or setting intention to move energy. Recently, I went on a trip to Kaua’i to visit Aunty Mahi’s family. I met one of her students who had been entrusted with her work to bless the Hawaiian community there in Kekaha. This student began to share with me how Aunty had taught her to look at the steam rising off the body. When she said, “the steam rising off the body,” and described exactly what I had been seeing for those years, I was blown away. It was a huge confirmation to me that we are receiving support and insight from our kumu who have gone out of the flesh. Support from our beloved teachers who stand behind this work now and forever. Lineage isn’t only important so that we can say who we learned from. Lineage is important because, at any given time, we are able to tap into that source. The word “kumu” means source. When it’s needed, we can be channels for healing energies to pour through from our kumu and from Spirit source. This is really the magic of Lomi Lomi. Of course, the lineage goes back to the beginning. As you go about doing this work, acknowledge and invite the support of the kupuna. Ask for the support of the ancestors in your work. Witness the profound shift that happens when we’re not trying to do it all on our own. I invite you to join us for the September immersion. Take one month of immersing yourself in the spiritual teaching and the technique of Lomi Lomi. Get to know being these amazing kumu and kupuna who have brought this energy all the way, to present time, for us to use to help serve our world. You can also meet me in Europe. I’ll be teaching in Spain, and Germany in just a few days. Send an email to [email protected] for details.